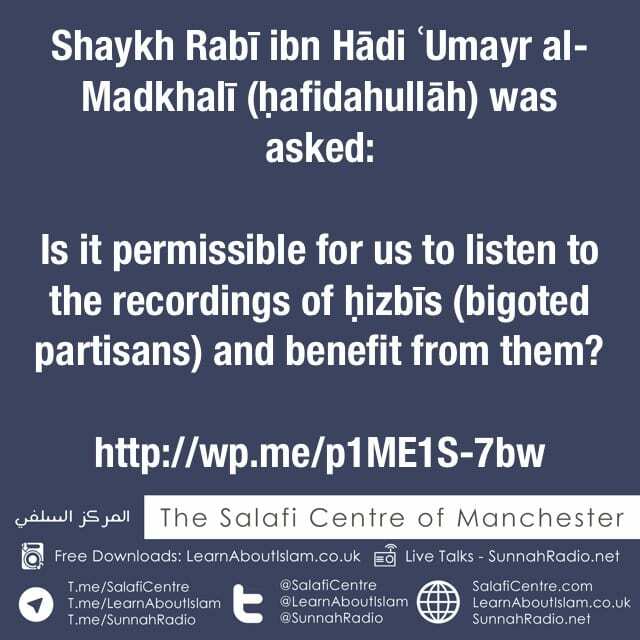 Shaykh Rabī ibn Hādi ʿUmayr al-Madkhalī [ḥafidahullāh] was asked: Is it permissible for us to listen to the audio [lectures of the] Hizbees? He [ḥafidahullāh] answered: No, do not listen to the audio [lectures] of the hizbees, because their harm is much greater than their benefit. Seek benefit from the Book of Allāh, the Sunnah of Allāh’s Messenger [alayhis ṣalātu was salām], the books and audio [lectures] of the scholars of the Sunnah. [That is] because the people of desires insert and conceal their poison in such a way that it is not noticed, except by the intelligent ones [i.e. the scholars and experienced students]. As for the Masākīn [i.e. those whose knowledge is very limited] amongst the smaller students of knowledge and the general folk, then verily this hidden poison has an effect on their intellects and against them, in ways they do not perceive. Therefore, let there be great caution against listening to the people of bidah and the people [who are ascribed] to those groups that have deviated from Allah’s True Methodology; and they [ḥizbīs, the people of bidah etc] warn against the books that[propagate the sound creed, methodology etc] and the books that [propagate the authentic] Sunnah, so how can we call to their books and the lectures [in their audio tapes]? !